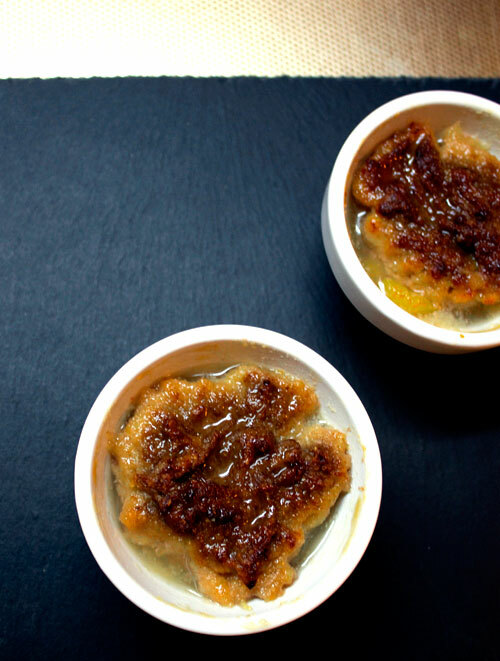 This sweet and hot little pudding is made with apricots tinned in fruit juice, topped with mashed banana, ground almonds and cinnamon, and baked with the juice, some grated stem ginger and syrup. I kind of think of this abitmoreveg recipe as an attempt at a gluten-free (and slightly healthier) version of Jocasta Innes’ Baked Buttered Apricots – it’s only after dawning on me to try to make that recipe with gluten-free white bread… I think I might just do that tomorrow. Spicy Baked Apricots – a simple little winter pudding. It’s so cold here. Definitely not salad weather. Although I have been making a lot of a brown rice version of the quinoa tabbouleh,which is very filling, a necessary characteristic of cold weather meals I think. By the way the brown rice version needs extra dressing – in case you decide to try it. When it’s cold like this my sweet tooth sharpens. I’m trying to cut down on saturated fat, but I still want to have something good and sweet for these dark chilly evenings. I’m also trying to come up with some nice and easy vegan desserts. At first I had this idea of baking peaches in ginger wine. I never got around to making it because I kept using the ingredients for other things. Then one evening searching around for somethings that would make a dessert I found a tin of apricots in fruit juice and I had some stem ginger in syrup. There were just two piece of ginger left but the syrup was still there to use. I also had some bananas and ground almonds – I pretty much always have these to hand. So I made a simple simple dessert by pouring the tinned apricots in juice in to a pie dish, pouring the syrup from the stem ginger on top of this and topping with mashed bananas, ground almonds and cinnamon. So simple and surprisingly tasty. This is pretty much the same thing except this time I grated some of the stem ginger (most of the stem ginger) and added it to the apricots. They add a lovely bit of heat to the pudding. I also baked these in individual ramekins but it works just as well in one pie dish. Here I also suggest a topping of a splash of coconut milk. Coconut does blend nicely with the flavours here. But being totally honest, my main reason for adding it in the beginning was just that I thought it would probably look well in the photos. I think it tastes well both ways. Because I am looking to reduce fat (and even though coconut milk isn’t considered to be “bad fat”) for myself I prefer it without the coconut. First dessert of 2016. Very simple, very tasty and vegan. Hope you like it. And now the first of 2017 too. Ground almonds, mashed banana, ground cinnamon, tinned apricots in fruit juice, stem ginger in syrup and a little coconut milk. Lightly grease a pie dish or 4 - 6 ramekins with a little oil. Empty the apricots, juice and syrup in a pie dish or divide them among ramekins. Grate 3/4 of the stem ginger from the jar and stir in with the apricots. Mix the ground almonds and cinnamon into the mashed bananas. Top the apricots with this mixture. There is no need for the apricots to be completely covered by the mixture. When done take out of the oven. Spoon some of the syrup from the side of the dish over the topping. Leave to cool for 5 - 10 minutes before serving. If using shake up the coconut milk so that it's well blended and add a little over the pudding. Sprinkle some cinnamon over it and a little pinch or two of grated stem ginger. You can pour any leftover coconut milk into an airtight container and keep in the fridge for another recipe. Adding the grated stem ginger gives this pudding a nice bit of spicy heat – perfect for these freezing winter evenings. Straight out of the oven – lovely sweet ginger smell. Spicy baked apricots – good enough without any topping. Spicy baked apricots with a splash of coconut milk, a sprinkle of cinnamon and a little pinch of some grated stem ginger.